Annual report looks at prevailing trends in meetings and events, including changes caused by new technology. Price rises, demand for unique venues and market disruption from event tech are the big areas to watch out for in 2019, according to BCD M&E’s trends report. The annual report predicts price hikes in the new year, with higher rates for venues. BCD advises implementing contracts or multi-year deals with hotel chains. Unique venues are high on the trends list, with buyers and attendees wanting more creative meeting formats, and looking beyond rows of seats in a hotel space. Museums, sports arenas and yachts are on trend for 2019, as is splitting up meeting venues and accommodation for delegates. Such separation will add to costs, but can translate into greater attendee satisfaction, says the report. With constant change over the last ten years, on-site event tech engagement continues to boom, whether it’s apps, live surveys or augmented and virtual reality. Expect meeting and event tech to become more of a necessity in 2019, as tech-driven meetings create masses of data. It means event teams can track results and improve ROI for the next event. 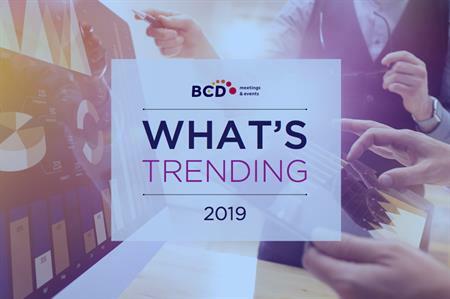 You can find the BCD M&E Trends Report 2019 here.